With age comes wisdom, right? Our collection of experiences grows into the body of knowledge that ultimately creates who we are. If the same can be said for plant life, ginkgo biloba could be the wisest plant around. This particular medicinal plant is the oldest living tree species, perhaps lending its collection of years to its wealth of health benefits and powers. Ginkgo biloba has been around for ‘hundreds of millions of years’. It has no close living relatives and is referred to as a “living fossil” because its closest relations are long since passed on and immortalized in fossils. Within this time, the ginkgo biloba tree has been used by numerous cultures as a traditional medicine and a source of healing food. Of more than 40 different components in the ginkgo biloba tree, scientists have identified two that they believe are responsible for its health benefits: flavonoids and terpenoids. These two components are credited with everything from boosting memory and mental sharpness to improving blood flow. 1. Improved Memory and Mental Clarity – Several studies have indicated ginkgo biloba has positive effects on brain function. Some have even shown it can improve memory in people suffering from dementia. In some, it’s even been shown to be as effective as prescription drug treatments. 2. Vascular Function – Many of the reported health benefits of ginkgo biloba are credited to its ability to improve blood flow. The terpenoids work by dilating blood vessels and reducing the stickiness of platelets. 3. Glaucoma and Macular Degeneration – The vascular health benefits of ginkgo biloba could be partially responsible for its vision benefits, namely in improving the vision in people with glaucoma and helping to stop the effects of macular degeneration on the retina. 4. Anti-Anxiety – One study found that people with anxiety disorder had fewer symptoms when on a regimen of ginkgo biloba than a placebo group who didn’t get the powerful herb – making ginkgo biloba one of many potentially helpful herbs for anxiety. 5. Pre-Menstrual Syndrome – There is evidence that taking ginkgo on a very specific dosing schedule could help reduce the symptoms of PMS including cramping, water retention, and more. (Here are 5 more solutions for PMS). 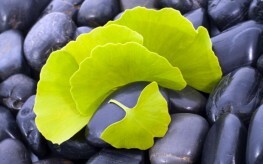 Ginkgo biloba is not new in the natural health scene—it’s been used for years as a way to increase mental sharpness. While case studies have shown varying results in people, it’s an option worth checking out for those of us who want to take advantage of the “wisdom” of an ancient tree.